So You Want to Sing Sacred Music, multiple contributors offer a broad overview of sacred singing in the Judeo-Christian tradition. Evan Kent, Anthony Ruff, Matthew Hoch, and Sharon L. Radionoff share their expertise on topics as diverse as Jewish cantorial music, Gregorian chant, post-Vatican II Catholic music, choral traditions, and contemporary Christian music. This plethora of styles represents the most common traditions encountered by amateur and emerging professional singers when exploring sacred performance opportunities. In each chapter, contributors consider liturgical origins, musical characteristics, training requirements, and repertoire and resources for each of these traditions. The writers—all professional singers and teachers with rich experience singing these styles—also discuss vocal technique as it relates to each style. Contributors also offer professional advice for singers seeking work within each tradition’s institutional settings, surveying the skills needed while offering practical advice for auditioning and performing successfully in the world of sacred music. 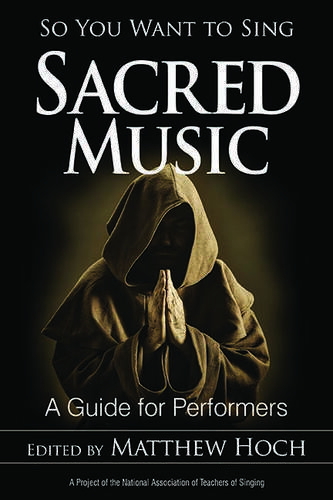 So You Want to Sing Sacred Music is a helpful resource for any singer looking to add sacred performance to their portfolio or seeking opportunities and employment where sacred music is practiced and performed. Additional chapters by Scott McCoy, Wendy LeBorgne, and Matthew Edwards address universal questions of voice science and pedagogy, vocal health, and audio enhancement technology. Matthew Hoch is associate professor of voice and coordinator of voice studies at Auburn University. He is the author of several books, including A Dictionary for the Modern Singer. He holds the BM from Ithaca College, MM from the Hartt School, and DMA from the New England Conservatory. Dr. Hoch is the 2016 winner of the Van L. Lawrence Fellowship, awarded jointly by the Voice Foundation and NATS. He actively performs art song, opera, chamber music, and in professional choral settings. Evan Kent is an oleh chadash ("new immigrant”) to Israel, having moved in the summer of 2013. Previously, he was the cantor at Temple Isaiah in Los Angeles for 25 years, also serving on the faculty of Hebrew Union College (the seminary for the Reform movement of Judaism) for 15 years. Dr. Kent’s publications have appeared in the Journal of Reform Judaism, Sh’ma Magazine, and Conservative Judaism. He also holds a doctorate in music education from Boston University. He is currently on the faculty of Hebrew Union College in Jerusalem, where he teaches classes in both contemporary and historic Jewish music. In addition to his musical and educational pursuits, Evan is an avid runner, having completed multiple marathons and ultra-marathons. Sharon L. Radionoff is director of the Sound Singing Institute, as well as singing voice specialist/voice technologist at the Texas Voice Center in Houston. She is an active clinician, lecturer, researcher and author. She is the author of two books—The Vocal Instrument (Plural Publishing) and Faith and Voice (Inkwater Books)—as well as many articles and book chapters. Dr. Radionoff earned a BME from Eastern Michigan University, a MM from Southern Methodist University, and a Ph.D. from Michigan State University. She also completed a professional fellowship at the American Institute for Voice and Ear Research Center in Philadelphia under Dr. Robert T. Sataloff.